The Advanced Research Internship Program (ARIP) is designed for high school and undergraduate students with a passion of academic and career path in science to promote intellectual growth through practical science, technology, and research experience. Students develop critical thinking skills, integrate concepts across the sciences through active learning, and use the latest technology to answer critical scientific questions. The ARIP Program is a highly competitive program. We are searching for passionate, creative, and cohesive students who are dedicated to performing hands-on research and collaborate with other researchers during the summer. ► ARIP program is a three-week intensive research internship program: One-week Online and Two-week onsite (University campus) program. ► The ARIP implements with the ARIP team of 11 distinguished professors conjointly as the same research topic ‘Investigating Environmental Genomics Through Informatics’ from four different universities in the United States. ► ARIP program enhances students’ creativeness and innovative leadership in the next generation. 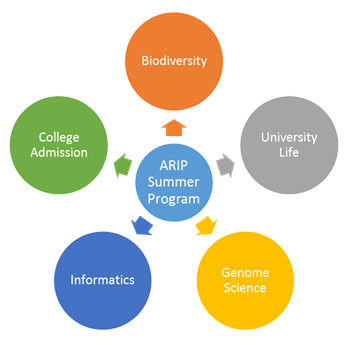 ► ARIP encourages students with a strong academic curiosity and desires considering a future in biology. ► The ARIP program consists of hands-on research under the direct guidance of a one-on-one mentor at a top class lab within the institute. ► The ARIP enriches students’ intellectual motivation into the practical research project with mentor professors. 1) How to collaborate with their colleagues during their research project in terms of producing a high qualified professional level research paper. 2) How to write a scientific manuscript for publication and how to prepare CV (Curricula Vitae) for their academic resume. 3) How to prepare CV (Curricula Vitae) for their academic resume.